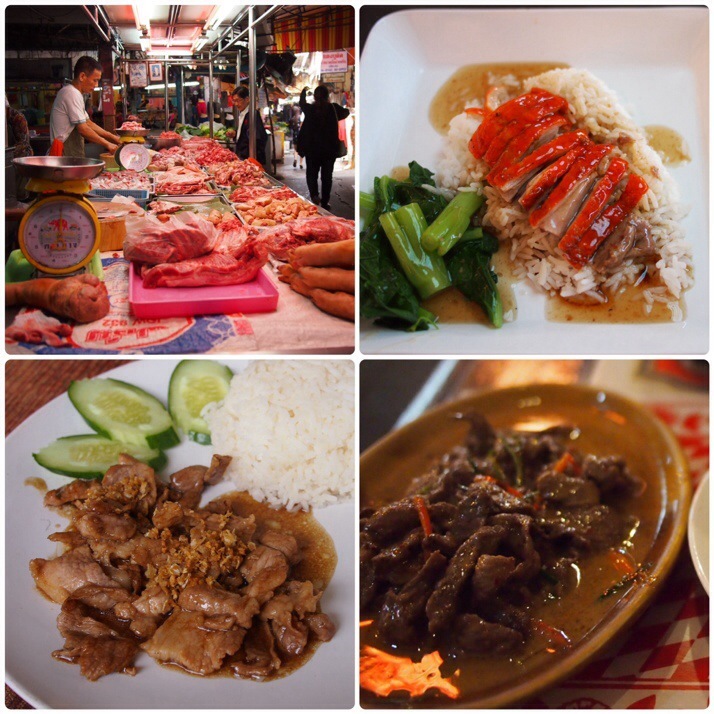 Thailand is famous all over the world for its delicious cuisine. We’ve been fortunate to spend three months in the country which has given us time to explore the different elements of it and even try cooking it for ourselves. 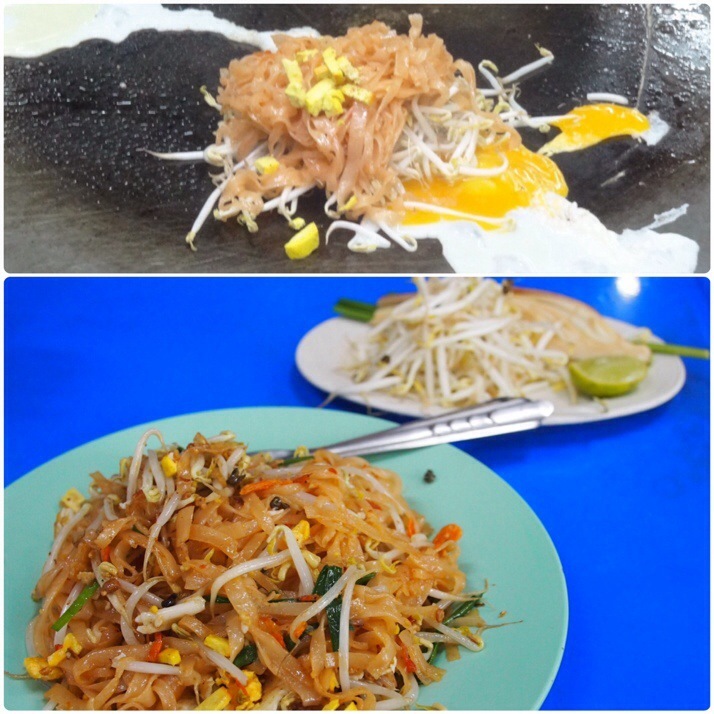 Rice noodles are a big part of Thai cuisine, often being eaten for breakfast or lunch. The stalls and restaurants selling them usually have quite a small menu meaning that they are served up very quickly after you order – real fast food. They come in two basic forms; in a soup, of which there are many varieties, or stir-fried, the most common form of which is Pad Thai. 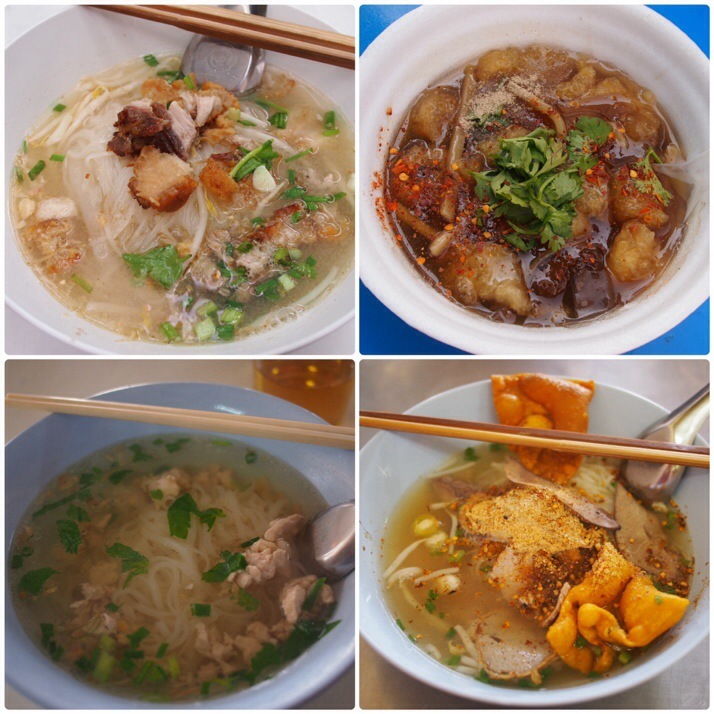 The basic noodle soup is similar to noodle soups we’ve had across SE Asia, a clear broth with rice noodles, meat, maybe some greens, and a choice of seasonings. Flavourings such as chilli flakes, garlic and chillies in vinegar, peanuts, sugar, and fish sauce are provided separately so that you can spice the dish to your own taste – a definite plus point if, like us, your chilli tolerance is nowhere near to Thai levels. We’ve also had more complex variants of the noodle soup including a particularly memorable one with crispy pork wontons. 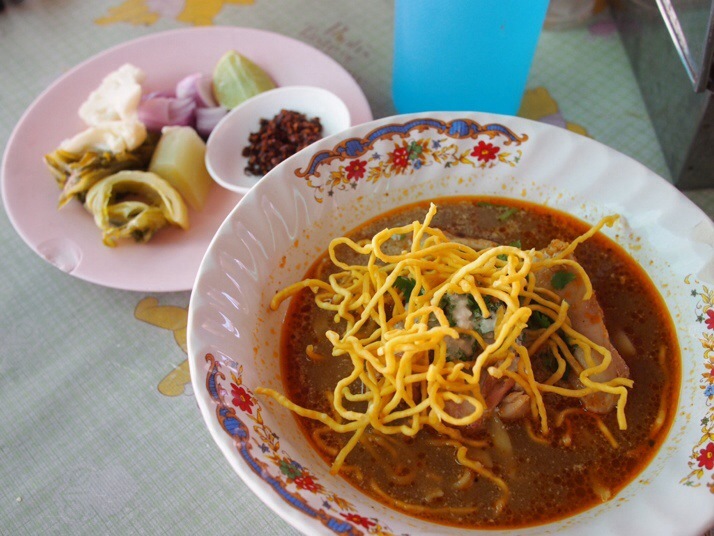 Khao Soi is a local specialty of Chiang Mai, a curry flavoured soup with fresh noodles and meat, topped with crispy noodles. It’s typically served with pickled vegetables. Pad Thai noodles are coated with a tamarind based sauce and then stir-fried with small pieces of firm tofu, fresh egg, dried prawns and beansprouts, occasionally with the addition of chicken or fresh prawns. They are served with fresh beansprouts, a wedge of lime and a slice of banana flower. If you’re not eating noodles in Thailand then chances are your meal will be served with rice. Steamed white rice is the most common. Order it as a side in a restaurant and it will cost you about £0.30. Fried rice is another easy fast food that we love, it’s available practically everywhere and is a safe option if you’re not feeling too adventurous. 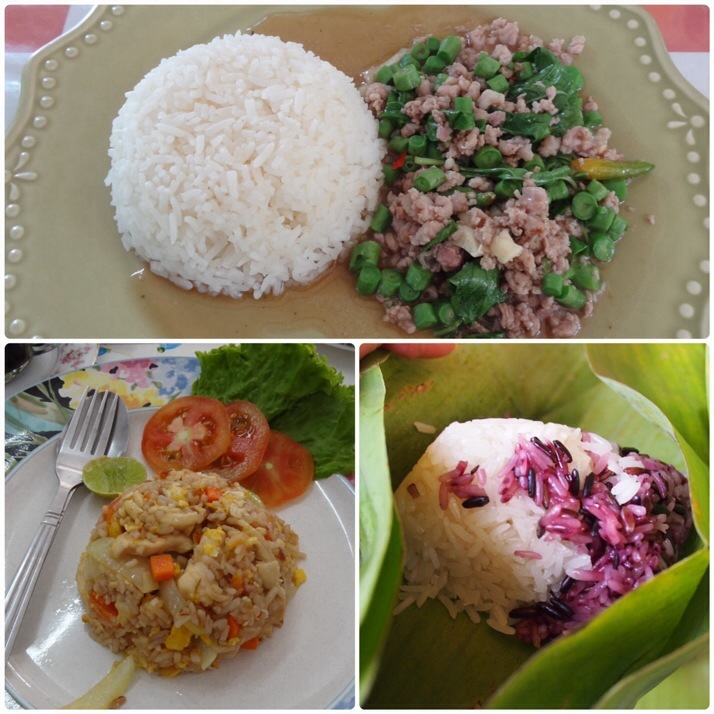 Sticky rice is a different variety, more common in northern than southern Thailand. It is usually found in parcels – either barbecued in a banana leaf or in a bamboo stem. Spices are really important in Thai foods and there’s an emphasis on fresh spices and herbs rather than dried roots or seeds. This results in food which tastes fresh and bright. Common flavourings are lemongrass, galangal, turmeric root, kaffir lime leaves, coconut milk and herbs such as Thai basil, as well as lots of fresh chillies. Seasoning and depth of flavour comes from fish sauce and soy sauce. The different spices are combined together in curry pastes which you can buy by the scoopful from the market (on a kind of pot luck basis as the vendors don’t usually speak English) or in sachets in the supermarket with enough for one meal. If you want to make your own curry paste then of course it’s possible to buy the whole spices and we’ve often seen them sold as little bundles with a bit of everything. We’ve tried various different types of curry and have found the green curry to be the most fearsome in terms of heat. 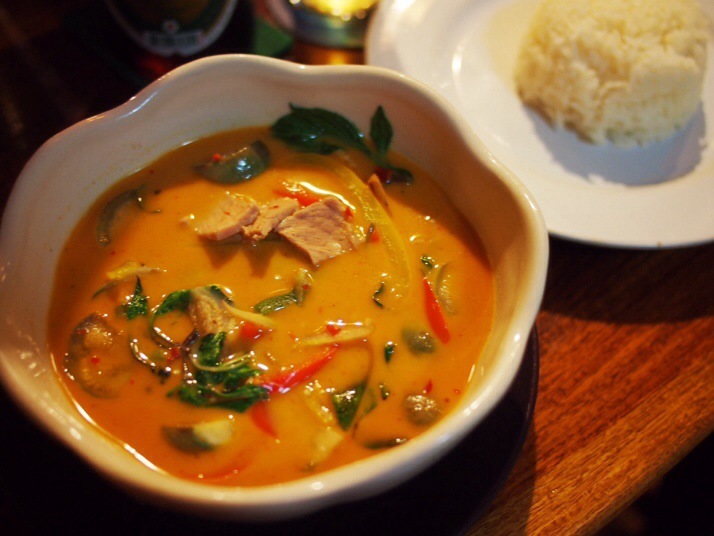 The curries are often quite soupy with lots of coconut milk sauce, or sometimes with a clear spicy soup like Tom Yum. They are usually made with meat but are just as delicious made with tofu or vegetables as we found at Pun Pun vegetarian restaurant. On one of our first forays to the market we were surprised to see big coils of sausage being cooked and sold. 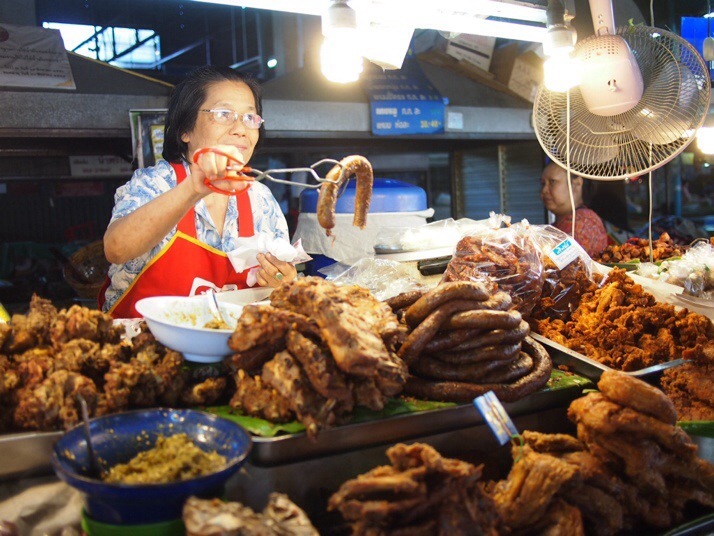 When we were offered a piece to try we were pleased to find that it was not a heavily processed pureed paste sausage but a proper meaty sausage, the Thai twist being the addition of lemongrass, chilli and other spices, this is another Chiang Mai specialty and is called Sai Aua. 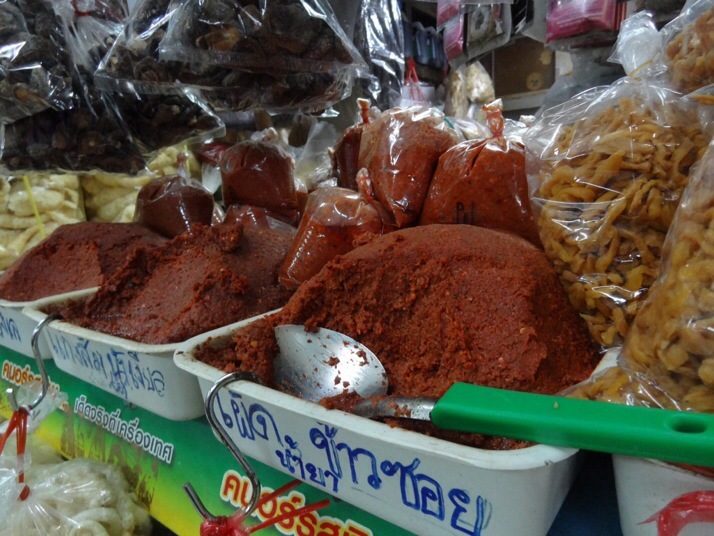 Another product that is usually sold alongside the sausage is Kaeb Mu which is fried pork rind, aka pork scratchings. One of our favourite sausage vendors, she always plied us with free samples! Chicken, pork and beef are all fairly common as are meat or fish balls, made from pureed meat with no discernible meaty texture – they always make me worry slightly about what might be in them. Even more worryingly, they’re sometimes shaped and coloured to look like Angry Birds characters – our cookery class teacher told us this was to make them more appealing to children… It’s rare to be offered a knife to eat with so meat is always in bite-size pieces and if you order roast belly pork (Andrew’s favourite) or roast duck it will be chopped before being served. We haven’t eaten a lot of fish but we’ve seen quite a few whole barbecued fish for sale and prawns are usually available as an option when ordering curry. The hills around Chiang Mai are cool enough to grow temperate fruits so strawberries and apples are just as common in the markets here as local tropical fruits – oranges, papayas, bananas and the dreaded durian. 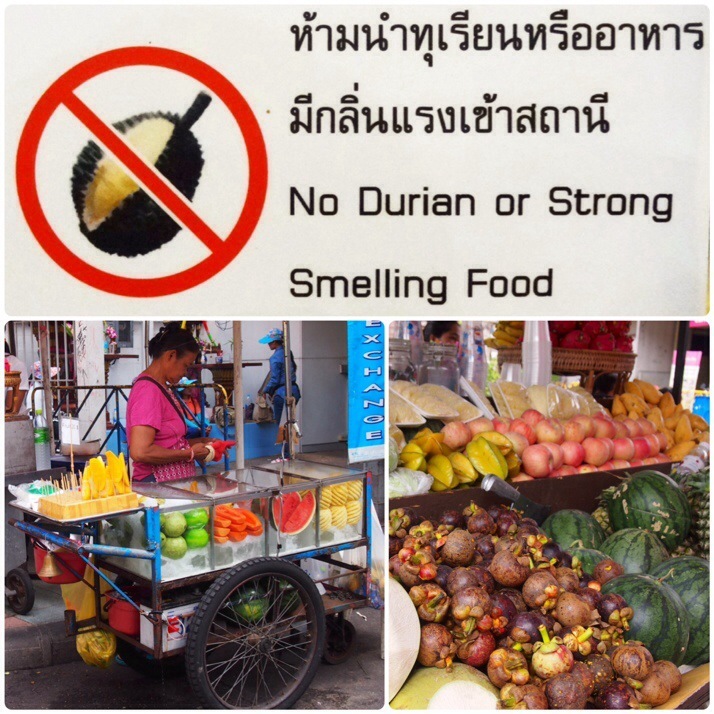 The first hotel that we stayed at in Bangkok actually had a sign on the door forbidding guests from bringing durian into their rooms – it is that stinky! Limes are used for everything from savoury sauces to refreshing sodas. Spicy sour salads made from shredded green papaya or green mango are found everywhere. They’re called som tam and are a delicious fresh way to wake up your tastebuds but frequently spicy enough to make me cry… Vegetarians should beware of these as they usually contain dried prawns as well as the ubiquitous fish sauce. Vegetables are often served stir-fried with soy or oyster sauce. These can be a mixture of carrots, cauliflower, baby corn and broccoli, or quantities of greens, there’s a type of spinach called morning glory and a type of kale which is very similar to choi sum. 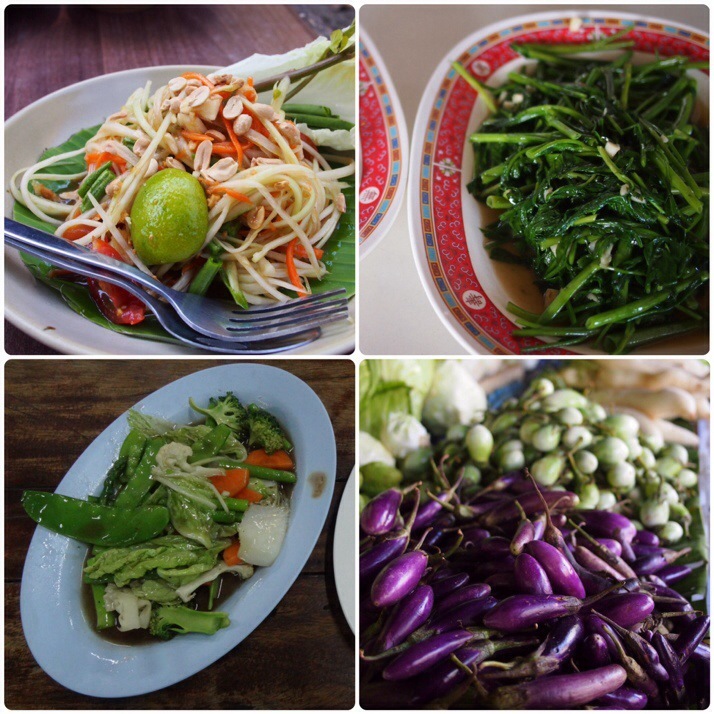 There are many kinds of aubergine (eggplant) available in Thailand not just the big purple ones that we’re used to. Everything from tiny ones that look like peas to stripy ones the size of eggs to big green and purple ones. The most common dessert that we’ve seen in Thailand is mango sticky rice, which as the name suggests is sticky rice with fresh sliced mango and a generous drizzle of coconut milk. There are also lots of street carts selling rotees which are somewhere between a flatbread and a pancake. They’re made from dough stretched incredibly thin and then fried and folded around the filling of your choice – we like banana drizzled with chocolate sauce. 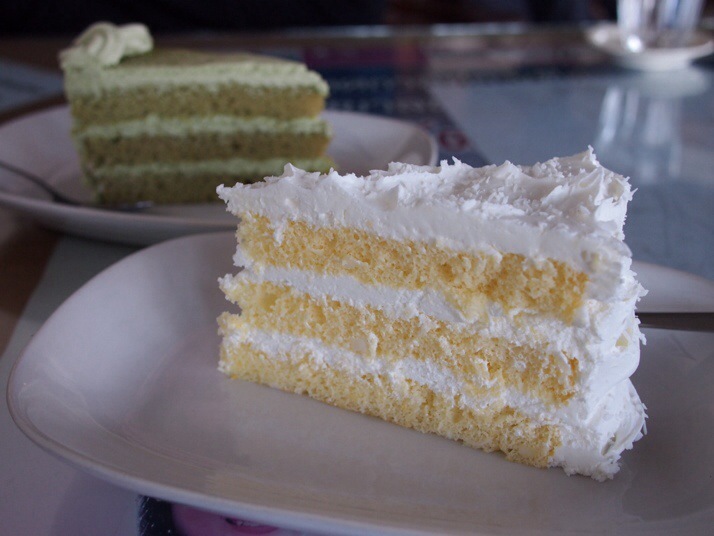 Cakes tend to be very light and well aerated, milk cake is damp and almost dripping with milk while coconut pie is a bit like lemon meringue pie but made with pieces of coconut flesh in the curd. 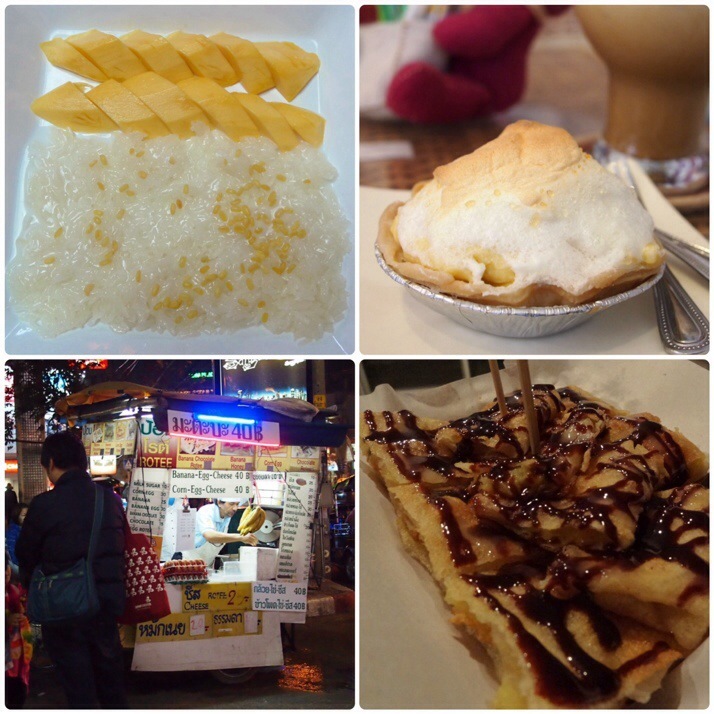 There are always lots of stalls selling snack foods when you visit a night market. 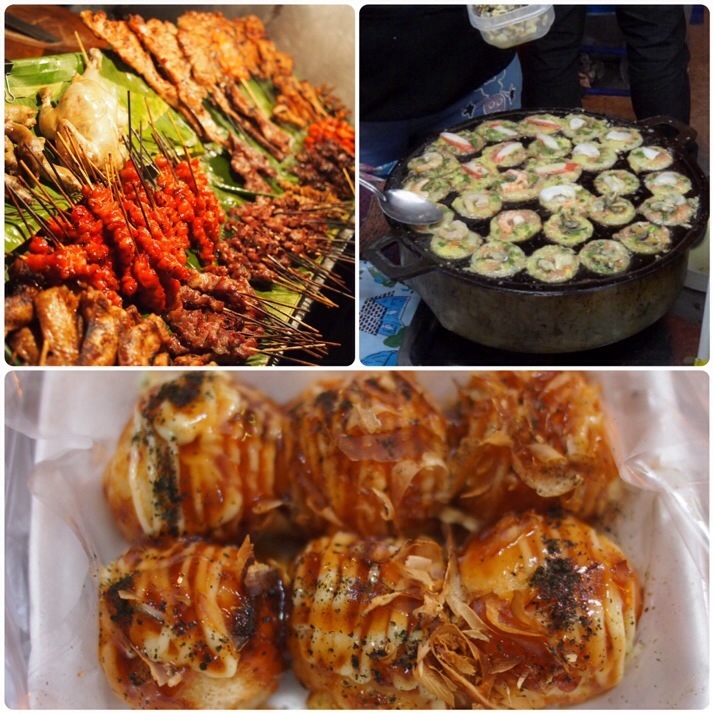 Mini omelettes, barbecued meat on wooden skewers, and takoyaki, a puffed ball of dough containing octopus, crab stick or other fillings, are all common. Having our own kitchen for two months in Chiang Mai has been great for me. I’ve really missed cooking while we’ve been in Asia and it’s always more fun to visit markets when you can buy ingredients to take home rather than just looking and taking photos. The kitchen in our apartment was small, just two hobs and a microwave with no oven and not many utensils so I’ve been slightly limited by what I can make. Pasta is always a good fall back but fried rice has become a favourite in the rotation and we’ve taken advantage of the curry paste sachets to make various curries as well as pad thai noodles. Buying whole pumpkins a couple of times required creativity to use up, soup and fritters were favourites. 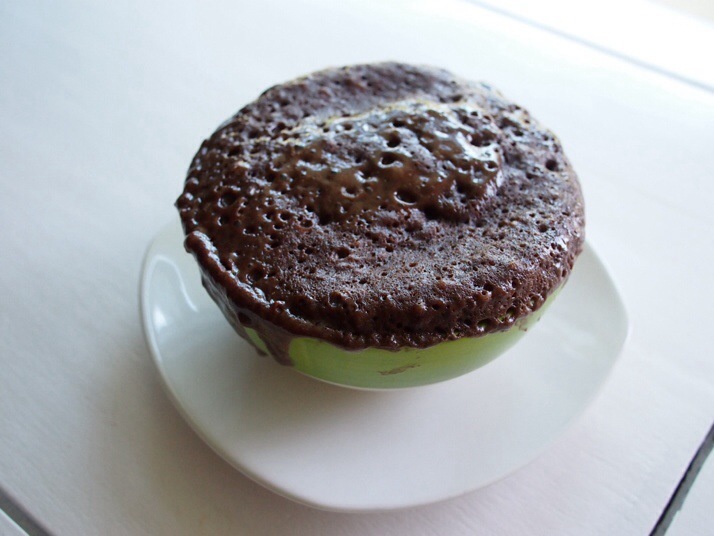 Not having an oven really stunted my abilities to make cakes and desserts although we’ve had a few batches of drop scones and also ‘Cake in a Mug’ which is a bit like steamed chocolate sponge but made in a microwave, as well as relying on bought Magnums and Lindt chocolate to satisfy our sweet cravings. Coffee is common and frequently high quality coming from the local area. As well as the espresso type coffees that we’re used to, it is also often iced, served with condensed and evaporated milk, cooling on a hot day but not as sweet as the ones we tried in Vietnam or Cambodia. Tea is also served iced and milky sweet. 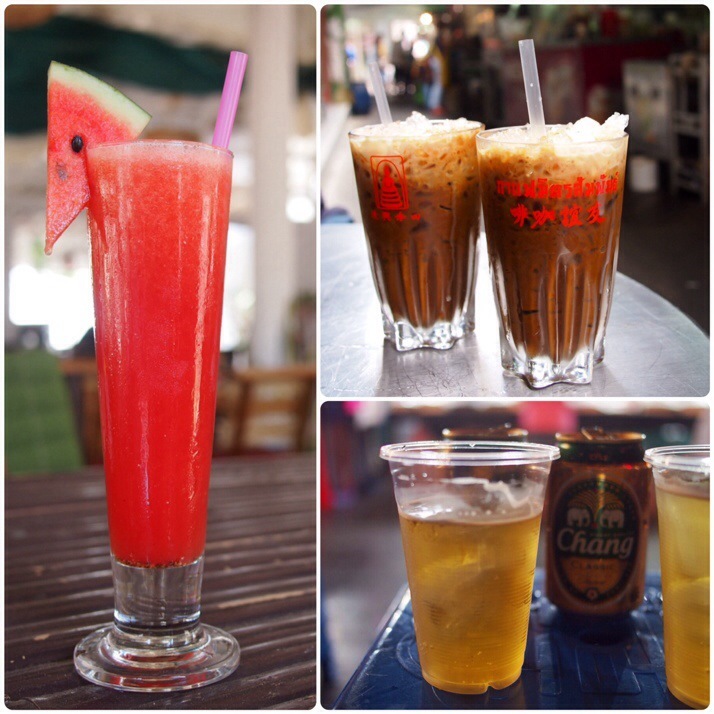 Street stalls everywhere serve up fresh fruit shakes which are a great cooler. High import taxes mean that wine and foreign beers can be prohibitively expensive. We did treat ourselves to London Porter at our favourite pub once a week or so but for the most part we stuck to our favourite local brew, Chang (that’s Thai for elephant you know) or made ourselves a cocktail with local rum mixed with iced ginger tea, lime juice and brown sugar. 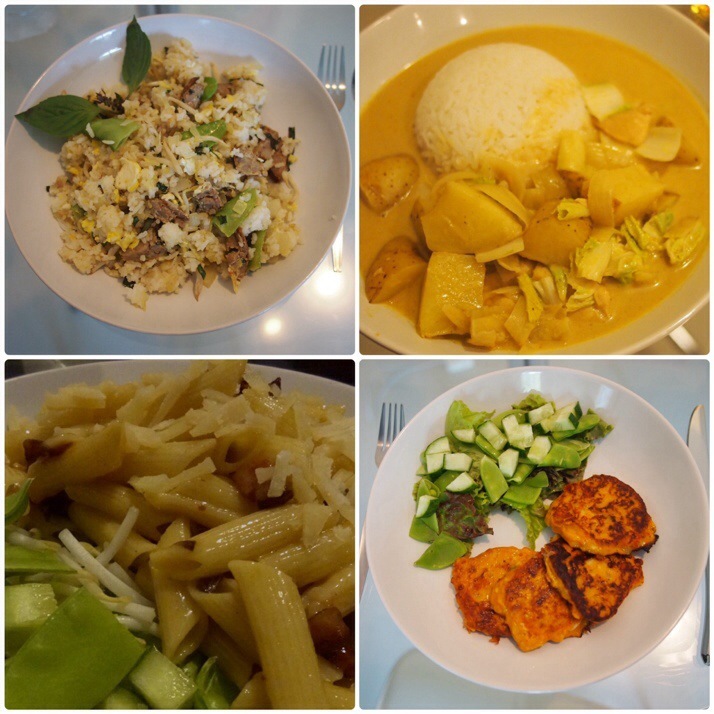 This entry was posted in Experiences and tagged Food, Thailand on February 24, 2014 by Julie. You’ve definitely got to hold a dinner party featuring the best dishes from your travels when you finally get home, you know. I saw on the BBC iPlayer that the Hairy Bikers were doing a tour of southeast Asia.. we’ll have to check out what they got up to in Chiang Mai and also what they cooked! What is 20 + 24 ?